Looking for an interesting instrument to play? Consider the banjolele. It’s a cool little hybrid that mixes the very best features of the ukulele and banjo together, offering a distinctive sound that lends texture and color to musical ensembles of every conceivable type. Louder than the ukulele, but with its same downsized scale and tuning, the banjolele features a fretted neck, prominent tuning pegs, and synthetic or natural calfskin heads. It’s important to note that a banjolele’s bridge “floats” on its head, and is held in place by the tension of the strings. You will have to put the bridge in position when the instrument arrives since it could puncture the head during shipping. Many models come with instructions for banjolele setup, plus there are video tutorials available that show how it’s done. Additionally, a luthier can do the job for you in a matter of minutes. Which is the best banjolele? In the interest of saving time and pointing you toward an enjoyable music-making experience, we’ve curated a list of ten of the best banjoleles. Presented in no particular order, complete with pros and cons, our banjolele reviews feature highlights from comments made by players new and experienced alike. Let’s get started! Made with beautiful Sapele wood and featuring a contrasting rosewood fingerboard, the Kmise 4 String Banjo Ukulele comes in a variety of appealing colors and finishes. At 23 inches long, this concert banjolele readily accommodates players with larger hands, and it offers a sweet, resonant sound with plenty of projection. Chrome-geared closed tuning pegs offer stability, and 18 frets make for confident playing. Pre-strung with Aquila strings for out-of-the package playing, it utilizes standard G-C-E-A ukulele tuning. If you’re familiar with the ukulele, you’ll have no trouble picking up and playing this fantastic banjolele as soon as it arrives. A classic banjolele with a mahogany back and sides plus a rosewood bridge and fretboard, the TFW concert ukulele banjo offers a 15-inch scale and is 24 inches in length. Geared tuners keep strings taut once they’ve finished the normal stretching process, and the tone offers a pleasant sound with plenty of volume. Aquila strings complete the package. Simply gorgeous! If looks are important to you, you’re probably going to fall in love with the Luna Ulu 8 Inch Concert Banjolele. Just like many of Luna’s ukuleles and guitars, this fantastic little banjo uke has plenty to offer in the style department. A clear drum head provides a view of a traditional Hawaiian Quilt motif etched into the inside of the back. Made with maple, mahogany, and rosewood, this instrument offers an appealing combination of beauty and durability. Chrome hardware and geared tuning machines impart utility. High-quality components including a Remo head, a mahogany resonator, and a stunning flame maple veneer headstock make this Oscar Schmidt banjolele a real standout. White binding adds a touch of contrast to the rosewood fingerboard, elevating the instrument’s appearance to even further heights. Concert-sized for easy playing, it features a closed back that provides an outstanding sound with plenty of resonance. Aquila strings are included. 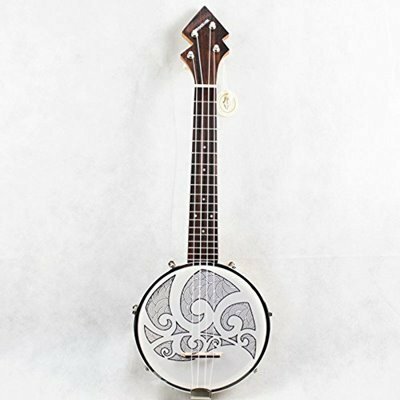 With a clear banjo head that provides a view of a whimsical spider etched into its back, the Aklot 4 String Banjo Ukulele is crafted of maple wood, with a matching maple wood fingerboard. 18 frets make it easy to find the notes you’re looking for. This banjolele comes with some nice extras: A JOYO digital tuner and a protective carrying bag are included. Like many of the best banjoleles on the market, this one comes with high-quality Aquila strings already in place. 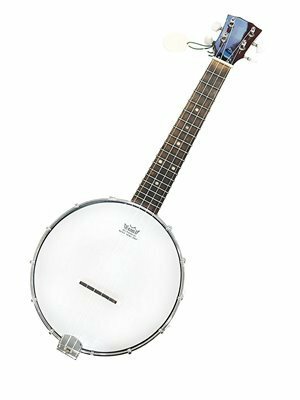 While the Kala KA-BJN BKC concert banjo ukulele is priced higher than other instruments featured in this series of banjolele reviews, it has plenty to offer in terms of style, functionality, and sound. Perfect for the player who is ready to step into a better-quality instrument, it features a classic black stain finish that offsets the white Remo Weather King banjo head to absolute perfection. Bright sound, snappy tone, and excellent projection make it perfect for playing solo or with an ensemble: Even when you’re with a large group of other players, your music will be heard! A protective case is included. An ultra-stylish tenor banjolele which makes an outstanding addition to any player’s collection, the Banjolele SideKick tenor banjolele comes as a complete package, with a padded protective gig bag, tuner, and strap to help you get started. 18 frets span the rosewood fretboard, which is embellished with mother of pearl inlay, and Aquila Supernylgut strings make for outstanding playability right out of the box. The drumhead is of high impact polyvinyl, and is available with or without a Polynesian-inspired tattoo design. The drum is made with seven layers of birch. Looking for a cigar box ukulele? You’re probably going to like the Eddy Finn EF-CGBX-1. A concert ukulele with a spruce top, back, and sides, it features classic cigar box motif on its front, plus a contrasting rosewood bridge and fingerboard. A clear satin finish protects the artwork and completes the look, and a padded gig bag lets you travel with greater confidence. A stylized, geometric head, friction tuners, and Aquila Supernylgut strings are just the beginning! The Banjo Uke SideKick Tenor Banjolele Ukulele offers a sweet, unique sound with plenty of punchy kick, and its high-impact polyvinyl head provides a nice Nashville-style twang. Large enough to accommodate players with big hands, this banjolele comes complete with a Naomi electronic tuner, a padded gig bag, and a fully adjustable shoulder strap, as well as tools for proper adjustment. 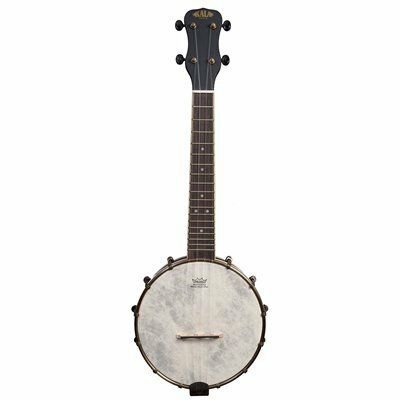 With an adjustable coordinator rod, open-geared machine tuners, and a mahogany neck and rim, the Eddy Finn Banjolele Series EF-UB-1 banjolele features a mahogany neck and rim, white binding, and a contrasting rosewood fingerboard. A Remo head imparts quality and provides plenty of great banjo sound. This banjolele comes with a free lesson and a heavy padded gig bag. 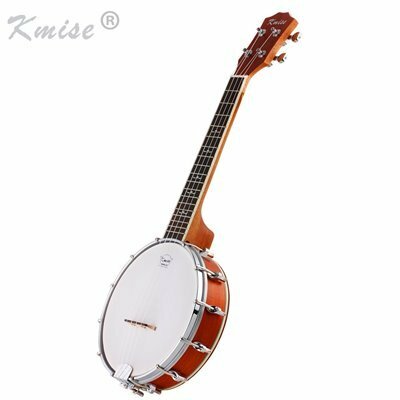 What to Look for When Buying a Banjolele Guitar? Ready to pick up a banjolele and start playing? Know what to look for, and you’re far more likely to be satisfied with your purchase. Just like ukuleles, banjoleles come in Soprano, Concert, Tenor, and Baritone sizes. Concert banjoleles are most popular; they offer a distinctive sound and are easy for most players to grasp. Kids and older players with small hands might appreciate the smaller soprano size, but will notice that the sound is a bit less rich than that of a larger instrument. If you’re of a larger stature, you’ll probably like the tenor or baritone size. Note that there are fewer of these from which to choose, but that those available tend to be of good quality. If you’re in the market for a high-end banjolele, you might do very well by picking up a used instrument. Do test it out or insist on a skype session with the seller so that he or she can demonstrate playability for you, and be sure that you get some kind of guarantee in writing if you’re having it shipped, particularly if it is a custom instrument. 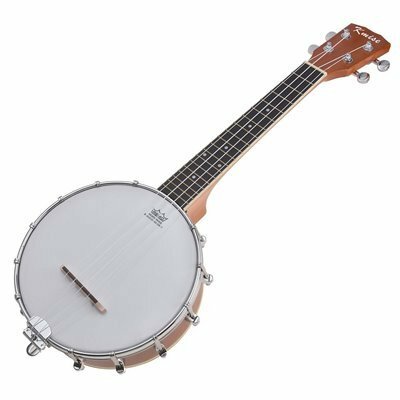 If you’re looking for a good beginner to intermediate banjolele, or if you’d like to enjoy greater confidence and quality assurance, then you’re probably best off purchasing a new banjolele from a trusted seller. If you can find a local music shop that carries banjoleles, then you’ll really be in luck as you can try before you commit to making a purchase. Whichever route you take, be sure to check warranty and return information. As we’ve seen from some unhappy reviewers, mishaps occasionally happen in manufacturing and shipping processes, just like with other products. It’s always a good idea to protect yourself. Traditional banjolele strings were made of gut, but most contemporary banjoleles are outfitted with nylon strings. Many feature wound third strings. Note that just like ukuleles and other instruments with nylon strings, there is a settling-in period that begins when you first start to play your banjolele. You’ll need to tune it frequently until the strings finish stretching; this is normal, even though some reviewers note it as a negative aspect. Good quality strings come with many of the banjoleles reviewed here; if your choice doesn’t include premium strings like Aquila, then you may want to replace them. And, because strings tend to break, it’s always a good idea to have an extra pair or two available so you can keep on playing even when the inevitable “snap!” happens. We’d like to wish you all the best as you search for an instrument that meets your needs. The best banjolele for you is out there; whether you’re an interested beginner, an intermediate player who’s ready to step into a better instrument, or a serious musician with an entire collection to enjoy. Happy playing – and we wish you all the best in your Banjolele journey.